Some users may accidentally bump keys while moving a hand or typing stick toward the key they want. Usually, the keys that are accidentally bumped are just hit for a very short period of time. The SlowKeys control helps filter these accidental bumps by telling the server to wait a specified period, called the SlowKeys acceptance delay, before delivering key events. If the key is released before this period elapses, no key events are generated. The server has a built-in key sequence that if either shift key is held for 8 seconds, SlowKeys are enabled. Likewise, another 8s press of either shift key disables them again. This may accidentally happen when playing games or scrolling through long documents. The server keeps two bitflags around. One for "accessibility features enabled" and one for "slow keys enabled". If the former is set, the key sequence above will activate slow keys (and thus toggle the second bit). 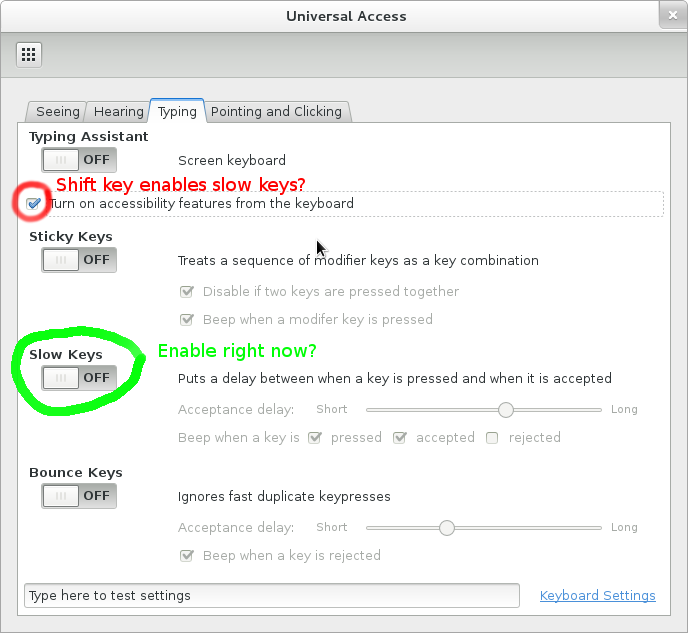 If "Turn on accessibility features from the keyboard" is checked, holding shift will enable/disable SlowKeys. If the SlowKeys toggle is on, SlowKeys are always on. in your log, you're likely better off disabling the checkbox. This patch will be in server 1.13 and server 1.12.3. 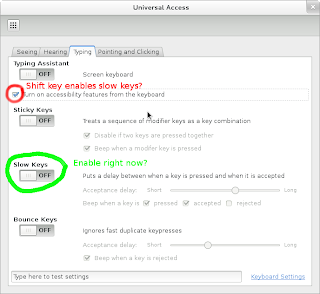 GNOME3 should also warn about SlowKeys being enabled but due to Bug 668213 it stopped doing so in January. Affected is GNOME 3.2+ but we're working on a fix to this. X Errors are supposed to be useful to the client, usually denoting some error code (e.g. BadValue) and, if possible, the value that triggered it. After reading the code, I found the _XkbErrCode2 family of macros that expand to fill in the error code. Easy enough to decompose on the client though there's no indication of which decomposed representation is the correct one. That's when I started wondering what the 0x16 could mean - could it possibly be _XkbErrBadValue (from xkbfile.h) Bit generic, but possible. But why isn't it using the define? Looking at other _XkbErrCode calls, some were somewhat close but others were miles out. XkbBell returning _XkbErrMissingVMods? That didn't make sense. And that's when it struck me: they didn't have any meaning. 0x16 is literally 0x16, the 22nd error code statement in this function. And, in this case also the 23rd since it is used twice. Of course, if one ever de-duplicate some of the XKB code the numbering is out. And I couldn't find a place where this is documented, so who knows how much damage we did to that approach without noticing. Anyway, if you ever have to google for _XkbErrCode2, I'm hoping this post now comes up and explains the despair you're about to encounter. When XI 2.1 smooth scrolling was released, we were glad to finally have a way for fluid scrolling events. Unfortunately, two design issues have since been discovered that make it harder for applications than necessary. Mea culpa, I apologise, these are things that we should have caught in the review process. Scrolling events are now posted through axes marked as scrolling axes. This means they're limited to the 32.32 fixed point value range that valuators can take. That range matters because despite scrolling being relative, coordinates in XIDeviceEvents must always be absolute values. Scrolling down is more common than scrolling up, so the axis will slowly accumulate until it reaches the maximum range. We have to reset them to 0 once we reach INT_MAX to avoid overflow so at some point you may see a scrolling event that jumps from something that's close to 232 to 0. You can at this point assume that this was not a valid scroll event. This is a rather theoretical case, overflowing this range requires a lot of scrolling, even on touchpads with a higher scroll increment. This is a more significant issue. The smooth scrolling information is part of the valuator data, but axis data is only sent in some events, and then only to some clients. Once a pointer leaves the window, the original client loses track of what happens to the valuators. Once the pointer re-enters the client's window it will receive the new axis value once more scrolling happens. That value is an absolute value but clients need the delta between it and the previous scroll event. That information is only available once the second event is sent to the client. For example, the axis data may be 3000 when the pointer leaves the window. Then the pointer re-enters the window and the first scroll event sends has a value of 5500. Since we don't know how much the axis increased elsewhere, we cannot act on this scroll event, we have to wait for the next one to calculate a delta. I confirmed with Carlos that this is indeed what GTK does: reset the scroll valuators on enter and then track the valuators for future events. Or, the same thing aligned in columns, though without colours (column doesn't parse the escape sequences for colors so the columns are misaligned). Package libpng12 was not found in the pkg-config search path. Alas, this error isn't shown anywhere and it doesn't end up in the log either. What does happen though is that GTK_CFLAGS gets replaced with an empty string, causing the build error above. Once I installed the required libpng everything works fine. But if you ever run into issues where the CFLAGS aren't quite what they should be, check the pkg-config commands for success. As pointed out in the comments, looks like we're looking at https://bugs.freedesktop.org/show_bug.cgi?id=4738 and https://bugs.freedesktop.org/show_bug.cgi?id=43149 here.